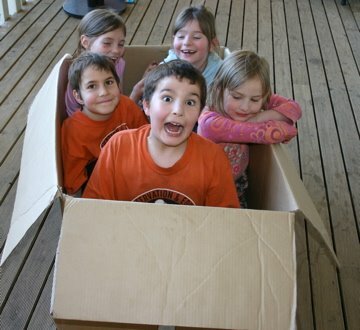 Why Homeschool is hosting the latest Carnival of Homeschooling. The revelation of our tradition for sharing lollies has certainly gained some attention. In addition to making swords for the boys, Dad has been bringing our gardens back into order after their Winter Exodus, preparing for the growing season. 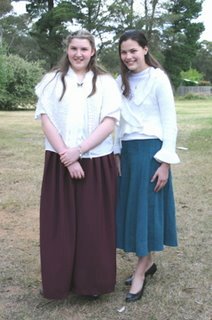 Although some consider this type of job a solitary occupation, Rose and Clare help out the way they like the best. Here you can see how Rose is helping. 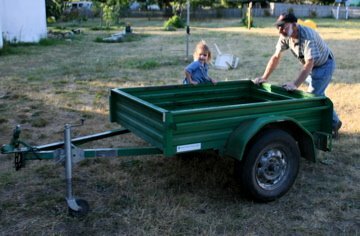 Normally the girls are on each wheel guard of the full trailer, "assisting" Dad push the trailer around from garden bed to garden bed. There is a huge Carnival of Family Life being held over at Adventures in the 100 Acre Wood. This week Peter (8) had a maths lesson about division and remainders. He had 25 lollies (candies) and had to evenly divide them between a number of people and work out the remainder. The first question was concerning four people. "They each get six and Dad gets one." "They get four and Dad gets one." "They each get two," and here Peter paused, then in shock said, "but Dad gets seven! That's not fair!" It was okay when I only got one to their four or six, but when I ended up with more, then it "wasn't fair". Lana's parents returned from their six month Winter Exodus about ten days ago. Without wasting much time, the boys handed Dad their construction requests. James wanted a Machine Gun - no, wait - a Sumarai sword. "Me too," added Peter. "And me," prompted Eric. "Well," replied Dad, ""Give me a pattern of what you want and we'll see." Yesterday was the revealing of some fine craftsmanship. 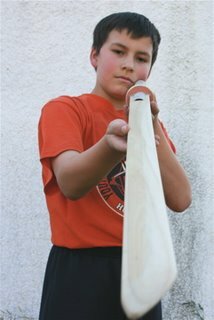 He used wood for the blade, a circle of wood cut for the hilt and a piece of PVC piping for the handle with a slot to strengthen and support the blade, all sturdily screwed and glued together. 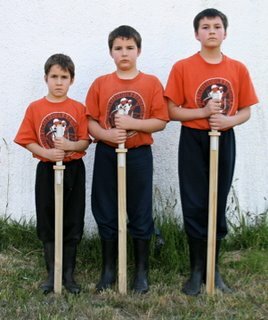 You will note from the photo that each sword is designed to be the right height for each lad, with the hilt at each lad's waist. The boys very proudly lined up to display their new weapons. Note how straight, shaped and smooth the sword has been made. Any imperfections in the wood have been patched and rectified. The boys are very happy their grandfather is home! 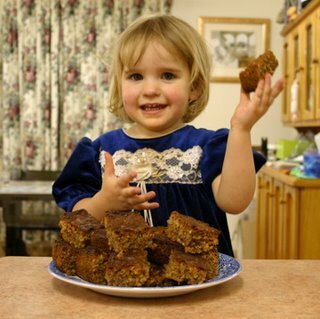 Meanwhile, Clare and Rose have recommenced their morning ritual of wandering from our house to theirs, knocking at the front door and being invited in for morning tea and biscuits (cookies). Hooray for Grandparents, we all say! Suzanne of Blessed Among Men has a great post on being a Super Hero. I'll let you read the tale of the story of the five sons as her closing comments make the tale. "I make milk. What's your super power?" I was working at one of my clients and noticed they had unpacked a huge box for a new computer server. I wandered over and asked the IT fellow, "What are you doing with that box?" "I'm just going to throw it out. Why?" "It'll make a good bus." I replied, smiling. So he helped me fold it and place it in my car, fitting, although blocking my rear vision mirror. When I arrived home I announced to the children I had brought something for them. Their eyes lit up as they realised how big the box was. Here are James, Peter and Clare with two friends all piled into the "bus". Since then, James has updated the bus into a time travel car, complete wiith computer, many seats and all the inner and outer working of a car. "It's got three pedals, a windscreen and mirrors!" "What's the thing you step on in the car?" asked Peter. "No," he continued, "the pedal to go faster." "Ah - the Accelerator." Phew! Australians travelling to the US can breathe a sigh of relief. The alleged ban on Vegemite has been declared "False" by Snopes. Snopes.com is a very good source for determining the veracity of so many claims made by email. In this case I was tricked by the source of the story - an Australian National news service. When I get emails of various scares or worries I do a quick Google search for "email hoax " and then some unique word within the story or email. Thanks for the heads-up Gina! This design is called Bankside by an Australian designer Graeme Ross. I started stitching this design whilst pregnant with Ariel and completed it while she sat beside me and I talked to her. This picture has moved with us and adorned the walls of many houses until we finally settled down here. We found that the collection of pictures I have created over the years quickly converted a rental house into a home. We even brought a number with us to the US. The earliest items we unpacked were the pictures, which were promptly hung onto the walls, so we could say, "Now we are home." Woe! Woe! and double Woe! Travelling to the US has become even harder. This time it isn't the terrorists or increased security. It isn't the 14 hour flight plus 3 or more hours hanging around the airport or customs. It's not even the cost of travel and accomodation. The US has banned Vegemite! How can Australians travel for extended periods to the US without their tasty Vegemite on toast? This will require much more careful planning and preparation to fast. Perhaps the best time to go will be during Lent so I can offer it up? Why are the children so funny? Why Homeschool is hosting this week's Carnival of Children's Comedy. As always there is plenty of children's humour to go around - Eric's Clingon Assault is included. That's why we always refer to children's humour as the Eleventh Reason. 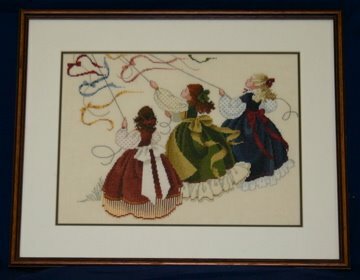 I read a few cross stitch forums and blogs and on one of them we have a small group. This group has a few exchanges during the year. One exchange just completed was a culture exchange. We were to make a small item with a picture of a magnificent building or scene from our country. 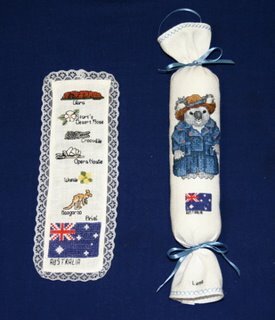 Being a young country, Australia was quite difficult. We don't really have many magnificent buildings and of the ones we have not many of them are charted in cross stich or were of the right size for the exchange. We had to be a little creative to work something out. Here is a picture of what we sent to Germany. The bookmark was stitched by Ariel and I made the needleroll. You can also see what Selina thought of it on her blog. 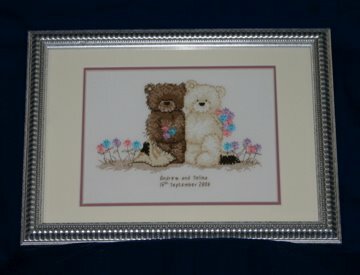 Selina was recently married so I stitched the happy couple a little picture as a gift. I didn't have it ready in time for the wedding and sent it along with the exchange items as a little extra surprise. The design also included a duckling which I left out to just have the two bears, I added a few more flowers in to replace the duck and framed it myself with some matt boards we had here. It worked out quite well. The trickiest part was making sure it all fit into a strong enough box and be under the postal weight limit. 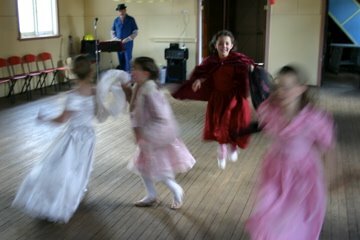 As mentioned yesterday, we enjoyed an 18th Birthday Bushdance on Saturday. The good thing about this type of affair is that all the family are part of the party. 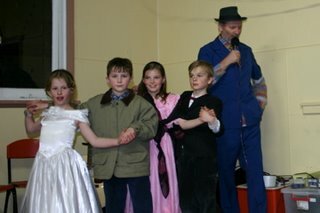 The older children get to dress up and dance with plenty of other youth of all ages. The younger ones play together in the neighbouring park or just enjoy their friends' company. While the excellent dance caller was getting ready and testing his equipment, some of the girls tested the dance floor with specially designed spins, twirls and giggling. I actually caught the young lady in the red dress in mid air with a huge smile! Once it was too dark to play outside almost all the children joined in the dancing. This photo is a sample of a couple of pairs of youngsters enjoying the dancing and prancing. By 9:30pm it was announced: "Clean up time" and even though families with little children departed, there were plenty of hands to make light work of the night's final duties. At Mass the next day we spoke to a number of the older children that attended who had stayed locally overnight. They all participated in the choir which certainly surprised the priest. As he entered the church he expected a small and quiet congregation. The choir began to sing with additional musical accompaniment and Father's face just beamed with pleasure and surprise. Update: The previous dance in July is reported here. 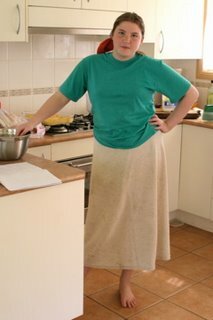 Saturday night was bush dancing night to celebrate one of the homeschool lad's eighteenth birthday. The dress was "Formal" which meant all the young lads and lasses had a great excuse to dress up for the ocassion. Ariel is standing next to one of her friends showing off their outfits. 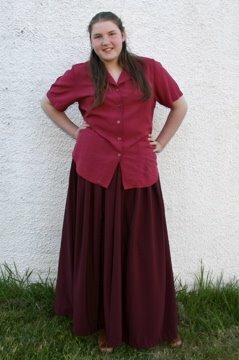 It was her excellent $1 Op shop value skirt and $1 white shirt. The shawl was an experimental one she made on our friends Tri-loom "to see how it worked." It works pretty well, I reckon. Ariel had a great time with all the others dancing a variety of bush dances and enjoying the company of almost 200 people. 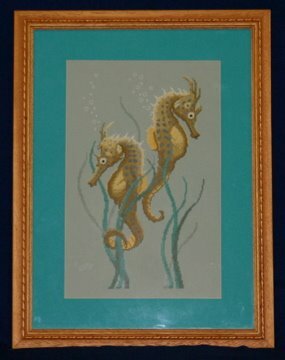 This was part of a selection of patterns I did with an animal theme and is currently adorning our spare bedroom. Kim of Life in a Shoe has once more prepared another Carnival of Children's Comedy. I appreciated her quote from the Headmistress of The Common Room regarding finding humour in everyday sitautions, especially when events are actually happening. Our post on Talking to Grandma is included. Catch the Wind is the first design I stitched from Lavender and Lace/ Butternut Road Designs by MLI. I stitched it back in 1994 when Ariel and Eric wasted their time watching Play School and Sesame Street on Television. This was before we turned the thing off and let the children play. It is stitched on 32 count offwhite linen. We have been taking photos of most of the completed and framed cross stitches that I have done over the years. Since this chart was done, I have completed six other of her large designs and five of the smaller or free designs she has on her website. Mum has also stitched about ten of her designs, making our houses mini Lavender and Lace display homes! We really enjoy our readers' comments on Bruggietales. They let us know our entries are being enjoyed and provided some useful information or entertainment. If you have enjoyed a post or want further information or want to add your own experience, please record your comments. It's pretty easy to do. Any that is relevant to the post, fit for family viewing, and respectful of all of our readers. We have no problems with disagreements with content so long as it is done with respect and no discouragement of the author or any other commenter. Pretty simple really. Until today we had a very open comments policy only requiring word verification to stop spam (which worked well). Unfortunately we have now had to introduce Comment Monitoring. This means every comment will need to be approved before appearing on the post. One reader from near Dahlonega Georgia using an Alltel connection had a jolly time last night (US time) over the space of about two hours making a collection of snarky comments all over the blog. Naturally, they were all anonymous which reduced the chance of any interaction to zero. So now, when you make a comment, its appearance may be delayed until it is approved. As part of our very important cultural Awareness Program we introduced the children to a Star Trek film. After all, how can the children interact with the society around them if they can't understand the references to Spock, Trekkies, "I'm giving her all shes got, Cap'n" in a thick Scottish accent and so on? Unfortunately this combines with their predilection for puns. In this photo you can see Rose's method of assisting Eric clean up the table. "Oh No!" cried out Eric, "I've been atacked by a Cling on!" Lana is sitting at the table, enjoying Rose's assistance. 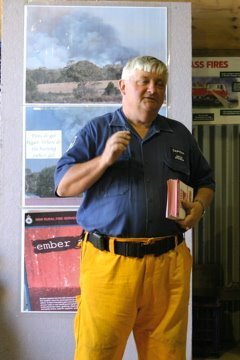 Today our local volunteer bush fire brigade gave a series of talks around the vllage informing residents of the facts about bush fires. The Captain of the brigade (pictured) explained that every resident needs to be fire wise and have a fire and evacuation plan. Do you stay and protect your property or do you leave? The key is preparation and your personal health. We will stay and protect our home. We have prepared the property by clearing out all the gutters, ensuring everything flammable is away from the house, we have proper clothing, water storage, and some fire fighting equipment. The main danger is "Ember Attack". The winds both before and after the fire send up clouds of burning embers which land all over the place starting many new spot fires. When the village was severely damaged by fire in 1965, houses began burning while the fire was still over 15km (10 miles) away and moving towards the village. As we haven't had a bushfire here since then and Australia is now officially in the worst drought in our nation's history, everyone is very concerned. There are currently major fires raging in various parts of the country, even the Snowy Mountains. The Fire Captain said that this is very unusual, as the Snowy doesn't normally get fires until around January and later. But the land is so dry and the weather is hot earlier than usual, so we are getting ready. There is a "Drought Index" which measures the severity of the drought. Currently the deficit in New South Wales is 140. This means that the moisture in the soil needs 140mm of rain (around 6 inches) to penetrate into the earth to get where we are supposed to be at this time of year. All that rain in one go wouldn't help as it would just run off. This is equivalent to a good soaking rain over a very long period. Yikes! That is some rain deficit to overcome. Somehow it has ended up as my job to polish the shoes and boots. Maybe it has happened because I always wear black shoes and while I am doing mine I get the honour of doing more. While my shoes only need a touch up here and there, I captured this image to show you the before and after view of the boys' shoes. This is a pair of Peter's boots. 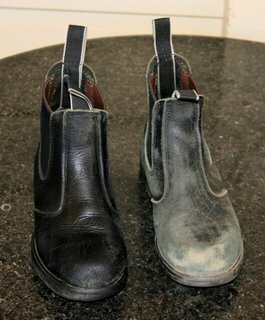 Can you guess which one is before applying a healthy dose of boot polish? This style of boot wasn't available in the US. As this is the main style of boots the boys ever wear, one of my missions when I returned to Australia on business was to buy three pairs of boots. We recently celebrated Peter's birthday. Birthdays are always special and we are lucky to celebrate so many of them during the year. Here is a summary of a typical birthday. Overnight I lay the table with breakfast bowls covering a selection of lollies (candy) in each person's place. The birthday child's favourite cereal is on the table and any presents are placed in MY place. Yes, that's right. The birthday child gets to sit in MY chair for the whole day. It's quite an honour. The birthday child also gets to choose their favourite dinner. Sometime during the day Grandma and Opa (Lana's parents) and Just Grandma(*) and Grandpa (my parents) call on the phone and wish and/or sing Happy Birthday. 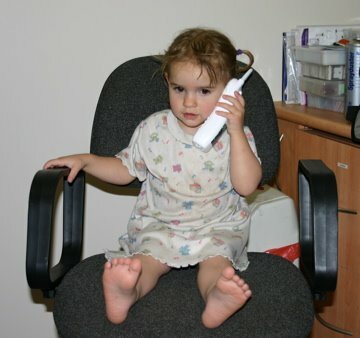 Naturally enough, when the grandparents call, all the children want to talk to them. This photo is of Rose listening to Just Grandma and nodding her answers. Unfortunately, it isn't a video phone so the conversation tends to be one sided. (*) My mum has been called "Just Grandma" since Ariel was three years old. We had started calling her Grandma Bruggie, but she said to Ariel, "No, just Grandma is fine." That was it. When Peter read the card Mum and Dad had sent, James commented, "Just Grandma spelled her name wrong. It only has Grandma." This post is a litle late but the inaugral Carnival of Catholic Homeschooling debuted at the Love to Learn Blog. It was a pleasure to see a link to G.K. Chesterton's great poem Lepanto, commemorating the sea battle which saved Europe from the Turkish fleet and rescued around 12,000 Christian galley slaves on 7 October, 1571. Our series of posts on the Evans Head camp is included. This is a simple recipe that makes a very tasty slice we obtained from one our US parish friends. This was also known as "fatty cake" or "Cornbread cake". When we asked why it was called cornbread cake - as the ingredients were nothing like cornbread - we were told it was because you mix it like cornbread! Just thrown in the ingredients and stir. Put all ingredients in a bowl and mix well with a spoon. Pour in to a lamington (9x13) tray. Bake at 180C (350F) for 35 to 40 minutes. Even whilst on vacation Kim of Life in a Shoe does her duty. The 26th Carnival of Children's Comedy strikes again with a humourous collection of tales from the littler people. I especially enjoyed the challenge of technology in "Raising them the Microsoft Way". Our expose of Rose modelling as a Peekaboo doll is included. With great amazement we realised that we have been home one year already. After two years and three months living in the US we returned home last September, wondering how we would settle back in to the old life. Surprisingly the transition was very quick and efficient. 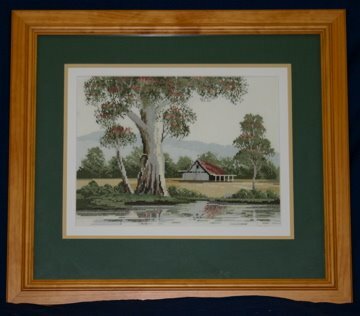 As we came back to our old house and all my existing clients, the intervening time overseas (the Australian term for International) quickly became a collection of fond memories. We became very grateful that I had decided to record our adventures in Bruggie Tales as we now had a great history of our time away. The children and us are able to go back through the blog and reminisce our time spent in a strange land and the wonderful people we met and with whom we became friends. Our arrival was a short post, but the return experience, with all of it's challenges travelling with around 30 suitcases and 6 children and 30 hours from start to finish is recorded in some detail. The September 2005 page has all the details, jsut scroll down for all the adventures. If you have ever wondered how that much people and packages would work, this is a great way to learn how we did it. And survived with enough good memories to want to try it again for a holiday in 3 years time with nine people. As a treat we had two American desserts. The first was Peach Cobbler topped with ice cream and cream. Tthe recipe for Berry Cobbler is here - we just used peaches instead of berries. The second dessert will be our next post - Pecan slice. Ariel was in charge of making the dinner with some assistance from Eric. This was a good opprtunity to show another "Style of Ariel". A simple green T-shirt with bone coloured skirt (a dangerous colour to wear in the kitchgen) with an inexpensive large red bow in her hair. Also her feet matched wonderfully with her "Emperor's new slippers". Today I made Ariel wear a different outfit to Mass so I could take a photo. This ensemble was obtained from Vinnies (an Australian Thrift Store) for a combined cost of $2.00 ($1.50 US). Initially Ariel thought the different reds wouldn't match, but I thought they went well. My colour co-ordination opinion rates quite low, but Lana also approved so it must have been OK.